San Gimignano remains an essential feature of any visit to central Tuscany, Italy, not only on account of its remarkable towers but also the fabulous frescoes and other art works to be seen here. However, during most days San Gimignano is packed with tourists. More than three million now visit the town annually, with sometimes up to 160 tour buses in the bus park at one time. 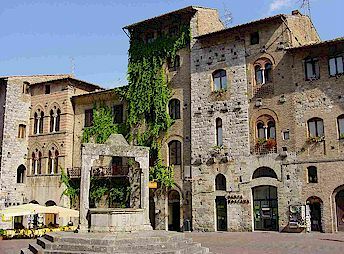 We therefore recommend that you come here in the late afternoon after the crowds thin out, or stay in or nearby San Gimignano, Italy, using it as your base for visiting Sienna and elsewhere during the day, and explore our town during the earlier morning and the evening. Mediaeval costume festival held each year on the third Saturday and Sunday of June in the streets and squares of San Gimignano. The Knights of Santa Fina re-enact the old "Feriae Messium" tradition with jousts between mounted knights armed with lances (Giostra dei Bastoni), plus food stands offering local gastronomic products including olive oil, wine and saffron together with a large arts and crafts market. The public is entertained during the festivities by minstrels, musicians, street performers and archers. 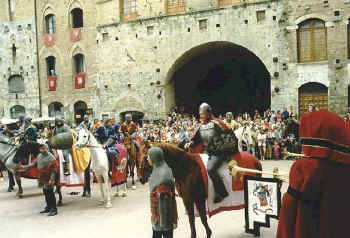 Costumed horsemen and characters parade in the Historical Pageant on the Sunday afternoon of the festival, culminating with a chivalrous tournament in the Parco della Rocca, where the four quarters of San Gimignano compete. The winning quarter parades through the city and celebrations continue into the evening. San Gimignano stands on a hill dominating the valley of the River Elsa (the Val d'Elsa). This hill was the location of a small Etruscan village during the Hellenistic period (200-300 BC) and San Gimignano began its life as a town in the 10 C, being named after the Bishop of Modena, St. Gimignano, who is said to have saved the village from the barbarian hordes. The town increased in wealth and developed greatly during the Middle Ages thanks to the "Via Francigena", the trading and pilgrim route that passed through it. One source of the wealth of San Gimignano during the later middle ages was the cultivation of Tuscan saffron - red gold - the profits from which helped finance the construction of tower houses that belonged to the rich saffron merchants. This prosperity led to the patronisation of artists whose paintings and sculptures adorn the churches and monasteries of the town. In 1199, San Gimignano became a free municipality and fought against the Bishops of Volterra and the surrounding municipalities. As a result of internal power struggles, San Gimignano eventually divided into two factions, one headed by the Ardinghelli family (Guelphs) and the other by the Salvucci family (Ghibellines). 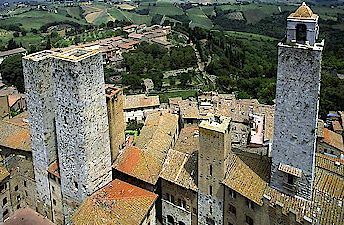 On the 8th May 1300 Dante Alighieri came to San Gimignano as the ambassador of the Guelph League in Tuscany. In 1348 San Gimignano's population was drastically reduced by the Black Death throwing the town into a serious crisis which eventually led to its submission to Florence in 1353. In the following centuries San Gimignano slowly overcame its decline and isolation and its beauty and cultural importance together with its agricultural heritage were recovered. The construction of the towers dates back to the 11 C and 13 C. The architecture of the city was influenced by that of Pisa, Sienna and Florence. There are 14 C paintings of the Siennese School to be seen and 15 C paintings of the Florentine School. San Gimignano is well-known for the production of the wine Vernaccia di San Gimignano. This is one of the most well-known white wines in Italy. It is golden yellow in colour and with a rich bouquet, and is suitable as an aperitif and also goes well with fish dishes. This wine has very ancient origins, and there are records of it dating back to the 13 C.
Besides traditional Siennese sweets like panforte and ricciarelli, the city also has one of its own, pinolata, which is made with cream custard and pine nuts. In the appropriate season there are also dishes made from mushrooms and aromatic truffles gathered from the nearby hills. Stay in a Tuscan farm house apartment for less than the price of a small hotel room. Click here for a large selection of beautiful villa accommodations, farm house apartments and room vacation rentals in Tuscany. 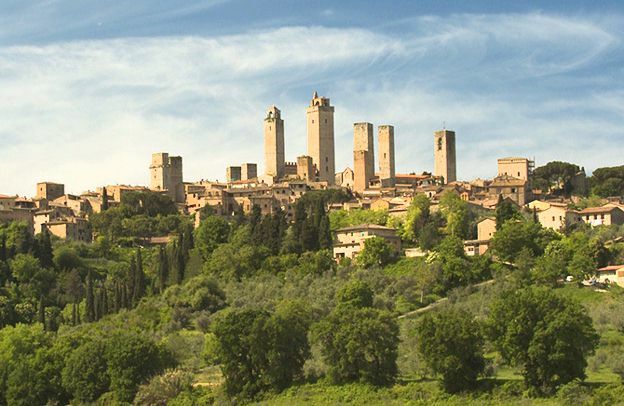 Wine tasting and sightseeing tour to San Gimignano. Wine tasting and sightseeing tours in Tuscany with Angela. San Gimignano wine tasting tour. Angela Saltafuori, an English-speaking, licensed guide and sommelier, drives groups of 2 to 8 visitors in a comfortable, air-conditioned minibus to visit Tuscan wineries and taste Tuscan wines. Join a shared wine tour to visit San Gimignano and a winery producing Vernaccia di San Gimignano for a wine tasting. More about Angela's San Gimignano wine and sightseeing tour. Vorresti pubblicizzare la tua attività su questo sito web per San Gimignano e ricevere traffico in entrata dalla nostra rete di più di 50 portali relativi? Clicca qui per ulteriori dettagli in merito alla nostra soluzione integrata per una presenza su internet piena di successi. San Gimignano © ammonet Website Promotion 2000 - 2018. All rights reserved.